"He's an analogue travelller with a penchant for anything that is gritty and archaic and puts them all in order with just a snap of his camera!" I started taking pictures on a family trip to the Massai Mara in Kenya. I bought a used analogue SLR with a few lenses and tried to capture the beauty of this area. I was so amazed by the possibilities of photography and the results I got, that I continued to dip deeper into the subject after my journey to Africa. I switched to digital photography and I tried my luck as a wildlife photographer for a couple of years. However a few years ago I felt the urge to try something new and a friend drew my attention to Lomography and their funky looking plastic cameras, After a little research I bought a Diana F+ and started to shot 120mm film. My analogue journey continued and I got a second Diana F+ and many other cameras (maybe too many). Currently I am living and studying french in Paris. So far the city has given me a lot of inspiration and there is a lot of things to discover in Paris. With a the right amount of curiosity, Paris can be a paradise for any photographer! Currently I am experimenting with all kinds of formats and systems. All my medium format images are either taken with a Lomo Diana F+, a Holga, a Yashicamat 124G or a Hasselblad 500c/m. 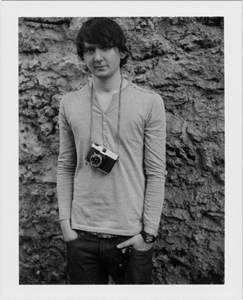 For my instant images I mainly use a Polaroid SX-70, a Polaroid SLR 680 or a Polaroid Land Camera 420. I like to work a lot with expired film material as it always gives some unexpected and beautiful results. I use a lot of slide film and let it cross-process to get those poppy colours and different color shifts. I also started to develop the black & white film myself and it is still an exciting experience to be in total control from taking the picture to the final scanned or printed result.